Bailey's Unicorn was a hit with caravanners looking for affordable luxury when it replaced the Senator in September 2010. It was revised two years ago and, while the Unicorn II added improvements such as its full-height opening front window, its looks have always been controversial. Now we have the Unicorn III. Gone are the old model’s quizzical face and Magnolia sidewalls, replaced by new front and rear mouldings and a crisp Polar White finish – making it the first all-white Bailey caravan for decades. Traditionalists may wince, but we reckon it’s a massive improvement, turning an uncomfortable-looking van into one that appears fresh and modern, if not as stylish as more curvaceous rivals such as the Swift Challenger. As well as the new colour, there are graphics that better integrate that front window, and preview the new company look with a stylised ‘B’ on the sides that gives the model more identity. Bailey has also added its company name in chromed script front and rear, plus, more fundamentally, there’s now a rounded rear roofline that’s claimed to improve fuel consumption on tow. It’s an eight-model range as before, with three twin-axle options, but here we’re concentrating on the single-axle Bailey Unicorn Cadiz, a big seller thanks to its popular layout of fixed twin berths with a rear washroom. Structurally, the new Unicorn follows the last model, using Bailey’s Alu-Tech construction with laminated, glassfibre-skinned panels bonded to an extruded-aluminium structure. Under the skin, Bailey has worked on passive safety by moving as much weight as possible to the centre of the new one-piece Al-Ko chassis, improving stability on tow. The gas bottles are in a centrally mounted locker on the offside, the battery is now under the floor behind the axle, and the GRP-lined wet lockers have been moved towards the centreline, having previously been in the nose. As you’d expect from Bailey’s range-topper, there’s an AKS hitch stabilizer, an ATC anti-snaking system and Secure wheel locks, but there are also fully balanced alloys with Michelin tyres, and each valve has a TyrePal pressure sensor. A monitor for this is a £90 option – and for a £30 you can add sensors to your tug’s tyres, too. The overwhelming sensation inside the new Unicorn is one of space. The design team has put a lot of work into refining the layout, liberating up to 15% more floor area (depending on model) and paring back the fixed bulkheads to give a more open feel. The standard upholstery in this new range of Bailey caravans is the new Kensington cloth, but we’d spend the extra £199 for the Trafalgar trim on our test Cadiz. It’s a carry-over from the Autograph motorhome range, with brown leatherette highlights. The sofas are up to 10% longer, which means that they can also be used as single beds for kids and smaller adults – at an impressive 5ft 11in and 6ft long. They also boast new sculpted armrests, and ahead of them at the forward end, hidden storage cubbies. Behind the comfortably raked backrests, the radiators for the Alde 3020 wet central heating have been moved up to prevent them being damaged in the bed boxes and to improve convection around the caravan – upper lockers are now vented for the same reason. Bailey has bold claims about the Unicorn’s year-round usability: in Alde’s cold chamber it achieved 32ºC inside with an outside temperature of -28ºC! An occasional table slides out from the front chest, and there’s a useful shelf above, but if you need more space you’ll have to retrieve the freestanding table from the rear wardrobe, which is less convenient. Look up and you’ll notice there’s no central rooflight – instead the new Unicorn relies on battery-saving and more attractive perimeter LEDs. Those frustrated by the old model’s split-level worktop will be delighted to discover that there’s a more conventional layout for 2015, and a flap should ensure plenty of food preparation space. A dramatic change in here is the 133-litre Dometic tower fridge-freezer – a Bailey exclusive for 2015 that gives more room inside while also taking up less floor space. It’s fitted to all single-axle models, and its repositioning to the nearside – at a useful height – gives more storage in the kitchen to make up for the locker space taken up by the central gas bottles. Kit-wise there’s all you could need in this Bailey caravan, with a dual-fuel four-burner hob, a separate grill and oven, along with an 800W microwave. One of the major criticisms of the old Unicorn was its small shower. The response for the new Unicorn III is a cubicle that’s 25% bigger, fully lined and LED-lit. A benefit of Alu-Tech construction is that the toilet can be mounted on the back wall, giving space for a good-sized offside wardrobe with a fitted laundry basket in the base. It isn’t the roomiest full-width washroom the Practical Caravan team has ever reviewed – but it’s worth the compromise for the improved space in the main part of the caravan. The other change in here is the loss of the towel rail, which struggled to heat the room; in its place there’s a proper radiator. In this range of Bailey caravans, the manufacturer has followed several rivals by adopting a track system for the front double rather than the more laborious method of pulling the slats out from beneath the seat cushions. Those cushions are comfortable, though you’ll need to turn them round to make a bed because the knee-rolls are pronounced. The fixed singles are not longer – they were already reasonable ‘his and hers’ lengths of 6ft 3in and 5ft 10in – but they are 2in wider, taking them up to 2ft 4in, in response to customer demand. That’s narrower than the largest in the class, but they don’t feel pinched and the walkway between is generous. There’s a mounting point for a television in the rear, hinged so that it can serve the lounge as well, but the TV is no longer standard equipment; Bailey found that customers wanted to choose their own brand, so instead it has equipped the Unicorn with a 100W Truma solar panel, along with a new external satellite aerial point. Locker space throughout this tourer is generous – and for 2015 Bailey has added soft-close to the drawers and overhead lockers. In fact, the finish throughout feels more polished. However, we’d have liked catches for those lockers, to prevent them coming open on the move. A leatherette magazine rack on the nearside lounge wall is ideal for storing the latest copy of Practical Caravan! The whole interior feels more coherent than the Unicorn II thanks to the new ‘Mendip Ash’ wallboard. We’re not wild about the two-tone satin and gloss, but the colour is far more contemporary – complemented by the fetching ‘Italian Stone’ worktops. Bailey’s approach to this third-generation Unicorn has been very sensible: retaining all of the good points about this popular family of tourers, but addressing the majority of the criticisms of the old model. Having concluded this review for Practical Caravan, we feel that the result of this work is a far more attractive caravan, both inside and out, at a very attractive price. At £20, 745 it’s only £145 than the 2014 model – and in the Cadiz you can really feel the benefit of tweaks to the layout to give a greater sense of space. 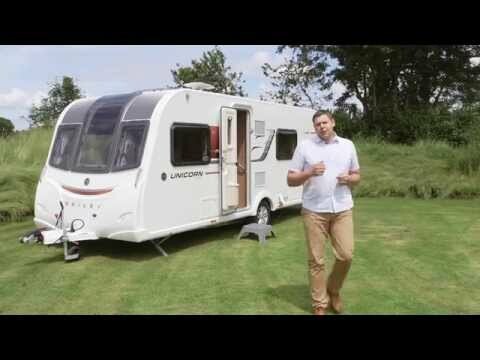 To get a full rundown of the entire 2015 range of Bailey caravans, including the rest of the third generation Unicorn range, please click here.